Are these contenders for ‘spin doctor’ of the year? There’s never any shortage of creativity when politicians, business and the media want to put a particular ‘spin’ – meaning an interpretation that furthers their own agenda, sometimes irrespective of logic, truth or salience – on an issue. I saw a couple of interesting ‘spins’ this week when the Victorian Government announced the public transport fare increase that takes effect from January 1 2012. Three in particular caught my attention. I don’t know if they’re “best in show” but I think they might be leading contenders for The Melbourne Urbanist’s (proposed) annual SPIN Award to honour excellence in deceptiveness, bias, self-serving behaviour and a related string of detestable (and yet to be defined) offences. Will you use less public transport as a result of the increase in fares in 2012? For what it’s worth, 52% answered no. But it’s not worth much because almost everything imaginable is wrong with this survey. For a start it’s a leading question, connecting the increase directly to “less” use. That might be tolerated in a newspaper survey, given a more neutral alternative could be a bit clumsy. But where it goes seriously bad is with response options that don’t settle for a straightforward “Yes” or “No”. Instead, The Age assumes it knows the reasons for the reader’s answer and and there’re only two possibilities – either “I can’t afford to pay” or “I’ve got no choice”. Other possibilities aren’t considered. What, for example, do respondents do if they want to say “No, I’m happy to pay to improve public transport”, or “Yes, it’s a matter of principle”? The response options should’ve been a straightforward and unambiguous “Yes” or “No” (and a “don’t know”, or similar, is always a good idea). But this is not a survey designed to get an objective answer. It’s simply and unabashedly part of the main news story. It might as well be a photo or a breakout box. It’s not there to add objectivity; it’s there to add a bit of “colour”. Even the single “No” answer on offer is heavily biased to a begrudging acceptance – “I’ve got no choice”. At first I wondered why journalism schools don’t give their students a basic grounding in survey design. After all, on-line surveys are ubiquitous. But then I realised that would be pointless – on-line surveys by media organisations are a tool of drama, not research. For example, a 2 hour Zone 1 Metcard will increase by 20 cents to $4 while a 2 hour myki cap will increase by 26 cents to $3.28. A Daily Zone 1 Metcard will increase by 60 cents to $7.60 and the daily myki cap will increase 52 cents to $6.56. A Daily Zone 1 + 2 Metcard will increase 90 cents to $11.90, while the equivalent myki fare will increase 88 cents to $11.08. 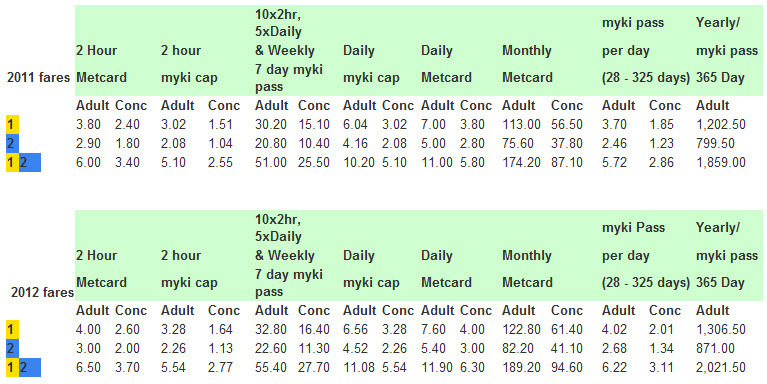 On this evidence Metlink won’t pass Communication 101, but the bottom line is myki really is cheaper under the new structure than Metcard is at present for the exact comparisons Metlink has specified. Trouble is, Metlink has very carefully cherry-picked its examples. It’s only true if the traveller shifts from a single use Metcard this year to a multi-use ticket next year (and not just to myki – works for multi use Metcards too). However all those travellers who already have a myki won’t be able to “beat the price rise”. Nor will regular travellers who currently use multi-trip Metcards like a 10x2hr or a 5xDaily be able to “beat the price rise” – Zone 1 versions of both those tickets cost $30.20 at present, or $6.04 per day for a two-way commute. Under the new fare structure, a daily myki cap will cost more – $6.56. The comparison Metlink is making is dubious – it’s not comparing apples with apples. Myki isn’t an “occasional” system like a 2 hour Metcard. Travellers don’t top-up $3.28 each time they want to make the occasional trip within Zone 1. Myki is more like a multi-trip Metcard – users who top-up via the web or the call centre must put in $10 minimum. I expect most people put in considerably more because it’s bothersome to top-up frequently. This after all is one of the advantages of myki. I never read those glossy magazine inserts in The Age (who does?) but on Friday I made an exception for The Melbourne Magazine because it promised to tell me “the most liveable suburb in the world’s most liveable city”. The Age’s Our liveable city project ranks the “liveability” of 314 suburbs from top to bottom and claims to reveal “Melbourne’s best suburbs, the ones improving the most, and where you should buy your next home”. Liveability is defined initially as “the general quality of a place that makes it pleasant or agreeable for people to reside in”. Fortunately, someone saw that was a tautology and wouldn’t be of any practical help. So liveability is subsequently defined by 13 measurable criteria. These cover topography, traffic, crime, cultural facilities and parks, as well as proximity to a range of amenities – the CBD, beaches, public transport, schools, restaurants and shops. Scores out of five on each criterion are added to give an overall summary score for each suburb. 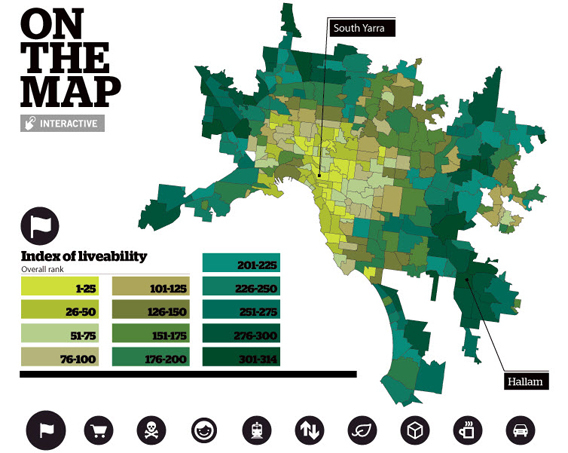 Each suburb is subsequently ranked from 1 to 314 on an Index of Liveability. Unsurprisingly with this sort of exercise, there was a lot of criticism from readers, with many pointing to apparent anomalies in the rankings. One said, “once I saw Footscray was rated higher than Middle Park I stopped reading”. Disagreement is inevitable. 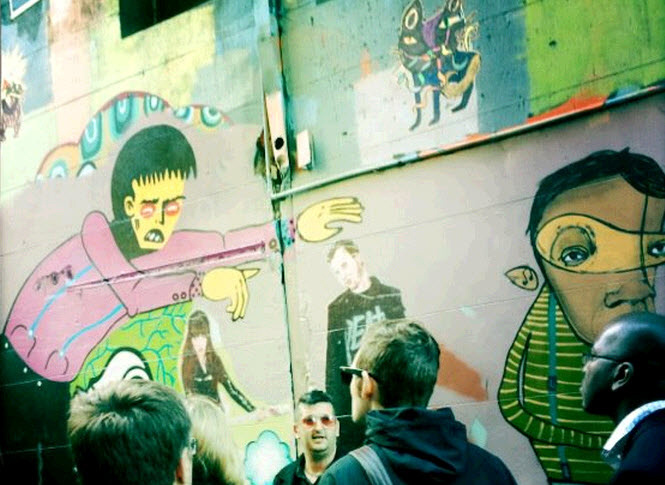 People are different and so it’s hard to get consensus on just what does, or doesn’t, make a place liveable. That shouldn’t be surprising – an elderly couple, for example, is likely to have a very different definition of liveability to that of a young single. Throw in further differences, say in education, income or ethnicity, and it gets much more complex. There is a much more straightforward and reliable way of establishing the relative liveability of suburbs. That simply involves measuring what people are prepared to pay to live in them i.e. property prices. It doesn’t require complex measures and weights (not that The Age bothered with the latter). In fact it sidesteps entirely the hardest and most intractable question of all – defining apriori just what liveability is. Moreover, it provides a clear ranking and allows us to measure the size of the difference between suburbs. And it’s based on the actual decisions of hundreds of thousands of householders. Knowing that the average property value in South Yarra is three and a half times higher than in Hallam is a much more useful and valuable piece of information about the relative merits of the two suburbs than knowing one ranks 350 places ahead of the other on the Index of Liveability. There’re distortions in the market so property values aren’t a perfect representation of the relative liveability of Melbourne’s suburbs. I would argue however that this approach involves infinitely fewer compromises than the methodology used by The Age. Of course it wouldn’t make a very interesting story when there’s the option available to the newspaper of bringing some “science” to the issue. That’s not to say exercises like the Index of Liveability don’t have value. They can be useful to establish just why residents think one suburb is more liveable than another. Knowing why properties average $1,300,000 in South Yarra and $369,000 in Hallam would be very important information for policy-makers. Is Bali selling itself short? Even more extraordinary, over 37,000 readers had already voted on-line in answer to this question posed by the newspaper: “Do you agree with the author that Bali isn’t worth visiting?”. I’ve never seen numbers this large in response to any story in The Age before – it seems readers are very, very interested in the topic of Bali. There’s no way I’m going to trawl through close to 1,000 comments, but my random sample indicates the weight of opinion is solidly against the author. She does herself no favours with a few naïve and possibly even condescending remarks. The weight of opinion from commenters is she should get over it and accept that touting is just the way it is across large parts of south-east Asia. If you don’t like it, they say, then don’t go there. Many argue that touting is an inevitable response to poverty – desperate people are simply trying to put food on the table – and should be accepted as part of what Bali is. But it seems most of the “silent majority” – that’s the 36,000 or so who don’t offer a comment but are sufficiently motivated to vote in the online poll – actually agree with Ms Webb. By 5.30 pm a decisive majority (70%) had voted that Bali actually isn’t worth visiting. That’s a very large number and suggests Bali has a serious image problem with the Fairfax demographic (and remember that Ms Webb’s article is about “Eat, Pray, Love” Ubud, not “drunks and druggies” Kuta). No matter what your personal feelings are about touting, there’s a sort of tragedy of the commons happening here. When touting by an aggressive minority of street vendors and taxi drivers puts off a large number of tourists, an entire economy of “back office” workers in hotels, restaurants and other downstream tourism industries is seriously threatened. As Ms Webb says, “aren’t there better ways of doing business? 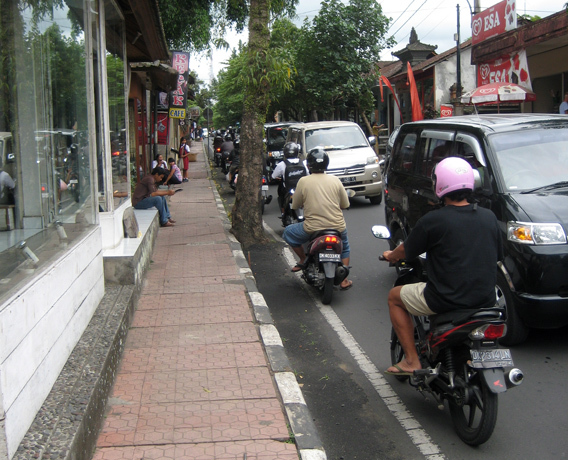 If a tourist is treated so badly they don’t want to ever return, isn’t that a bad thing for Bali?”. Is this the end of The Age (as we know it)? My family let our subscription to The Age lapse the other week. It’s not that $419 p.a. isn’t good value – we’d be prepared to pay a bit more if we had to – it’s just that no one in the household reads the print edition of the paper anymore. And we no longer have to pay anything to read The Age electronically! My wife has a free six months subscription to the iPad version and I read the free online version. More often than not, the home-delivered paper version never got unrolled. So when the decision came to renew for another year there was no point in pouring another $419 down the drain. Maybe if the circulation department had followed up with a sweetener we might’ve changed our mind out of habit or because the idea of not reading The Age every morning over coffee and croissants is ‘unMelburnian’. But the company didn’t seem overly bothered about losing us (unlike, for example, lean and nimble Crikey, who worked harder at getting me to resubscribe). Fairfax is having serious problems with its papers. As I understand it, the Sydney Morning Herald is on the verge of going into the red and The Age isn’t far behind. For Melburnians, there is a high probability that The Age as we know it will disappear from newsstands sooner rather than later. The problems for Fairfax, the company that owns these papers, started with the enormous drop in revenue from classified advertising. These were rightly called “rivers of gold”. Older Melbourne readers might remember the advertising slogan “icpota” (“in the classified pages of The Age”). Fairfax wasn’t very successful in adapting to the online world – companies like car.sales.com, seek.com and eBay stole its market dominance. Nor does the company seem much better today – only last year my Fairfax-owned local paper, the Banyule & Nillumbik Weekly, was blindsided by a newcomer, the Weekly Review, which took over virtually all its real estate advertising. This week the Fairfax paper is 20 pages (with one half-page real estate ad), the Weekly Review is 96 pages (with 79.5 pages of real estate ads). Another problem for Fairfax is the well known shift of readers (like me) to online media. The company feels it has to have an online presence to “stay in the game” yet it’s too nervous to put up a paywall for fear it will lose readers to other online sites that stay free. It’s earning modest revenue from (awfully intrusive!) online advertising, but Fairfax’s experience with putting its third paper, the Australian Financial Review, behind a paywall hasn’t been positive. The AFR lost visibility because it couldn’t be accessed by search engines, giving newcomers like the online Business Spectator a free kick. From what I can gather, the financial situation of the AFR isn’t healthy either. Is the proposed airport train off the rails? The idea of a high-speed Melbourne Airport-to-CBD rail line is in the news yet again, this time advocated by the RACV. You’ve got to give the Royal Automobile Club of Victoria its due. While simultaneously calling for roadworks to reduce congestion and improvements to traffic flow in Hoddle Street, it’s morphing into a general transport lobby group that “advocates improved transport services for all its members, including those who use public transport”. This story on the RACV’s call for an airport train has attracted over 100 comments, most of them favouring a rail line. There’re the same themes that come up every time The Age runs pro-airport rail stories – it’s embarrassing that Melbourne doesn’t have a dedicated rail line; car parking prices at the airport are extortionary; Skybus fares cost an arm and a leg; the contract with Citylink won’t allow competition; and the airport and taxi industry won’t let anyone kill their golden goose. Even while they approvingly cite the example of Sydney’s and Brisbane’s airport trains, commenters nevertheless generally assume an airport train would be high speed, would solve congestion on Melbourne’s freeways and would cost no more than a Zone 1-2 fare. I’ve explained before why an airport rail line is unlikely to make sense for a while yet, but it’s a good idea to take another more considered view of its prospects than those advanced by unabashed boosters. Here’re twelve reasons why a rail line to Melbourne Airport is unlikely to make sense for a while yet. First, Skybus already provides a dedicated public transport service from the airport to the CBD with higher frequencies and longer span of hours than any train service in Melbourne. Most times trips to Southern Cross station take 20 minutes. While they blow out to over 40 minutes in peak hour, that could be addressed for a fraction of the cost of a new rail line by extending the existing dedicated on-road lane to other sections of the route that are prone to congestion. Second, there’s little to be gained from spending more than a billion dollars to replace a high quality public transport service (Skybus) with another one (train), when the money could be spent on providing better public transport to areas that don’t currently have adequate service. Will E-Gate curb suburban sprawl? I like the (very) notional plans for redevelopment of the old E-Gate site in west Melbourne to accommodate up to 12,000 residents published in The Age (Thursday, 10 March, 2011). Putting what might be 6,000–9,000 dwellings on 20 highly accessible hectares on the edge of the CBD makes a lot more sense than the mere 10,000–15,000 mooted for 200 hectares at Fishermans Bend. But I do take issue with the claim by the Minister for Major Projects, Denis Napthine, that it’s a very significant development for Melbourne “because we want to grow the population without massively contributing to urban sprawl”. The Age reinforces this take by titling its report “New city-edge suburb part of plan to curb urban sprawl” and goes on to say that it’s the first big part of the Government’s “plan to shift urban growth from Melbourne’s fringes to its heart”. I’ve always liked the idea of E-Gate being redeveloped but, as I said on February 19 in relation to a similar report on proposals for Fishermans Bend, the significance or otherwise of the project for fringe growth has to be assessed in the context of the total housing task for Melbourne. In the twelve months ending 30 September 2010, 42,509 dwellings were approved in the metropolitan area, of which around 17,000 were approved in the outer suburban Growth Area municipalities. That’s just for one year. E-Gate’s 6,000 – 9,000 dwellings would be released over a long time frame, probably at least ten years and quite possibly longer (the Government says Fishermans Bend will be developed over 20-30 years). Existing leases on the site run till 2014 so it’s likely the first residents won’t be moving in for a long time yet. Of course it all helps but the contribution of the three redevelopment sites identified by the Government – E-Gate, Fishermans Bend and Richmond station – to diminishing pressure on the fringe will be modest. They don’t collectively constitute a sprawl-ameliorating strategy. Melbourne still needs a sensible approach to increasing multi-unit housing supply across the rest of the metropolitan area. The “brownfield strategy” is in danger of becoming “cargo cult urbanism”.